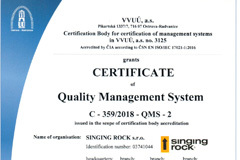 Since December 2000 SINGING ROCK has Quality Management System certified according to requirements of ISO 9001 standard with regards to development, production and sales of Personal Protective Equipment against fall from a height (Module D Regulation (EU) 2016/425 of the European Parliament and of the Council) and training and consultation services for securing persons at height. Our Quality Management System and even our products are certified by Certification Body no. 3125 and withal Notified Body no. 1019 VVUÚ, a.s. Ostrava-Radvanice (Czech Republic). ISO 9001 is an international standard compiled mainly from requirements on Quality Management Systems. Implementation of such requirements into management of organization processes and its fulfilment helps organization to satisfy customers' needs and reach its business targets. This directive deals with development, production and sale of Personal Protective Equipment (PPE). Module D of this regulation requires to establish and certify quality management system needed for development, production and sale of PPE. In JULY 2018 SINGING ROCK s.r.o. 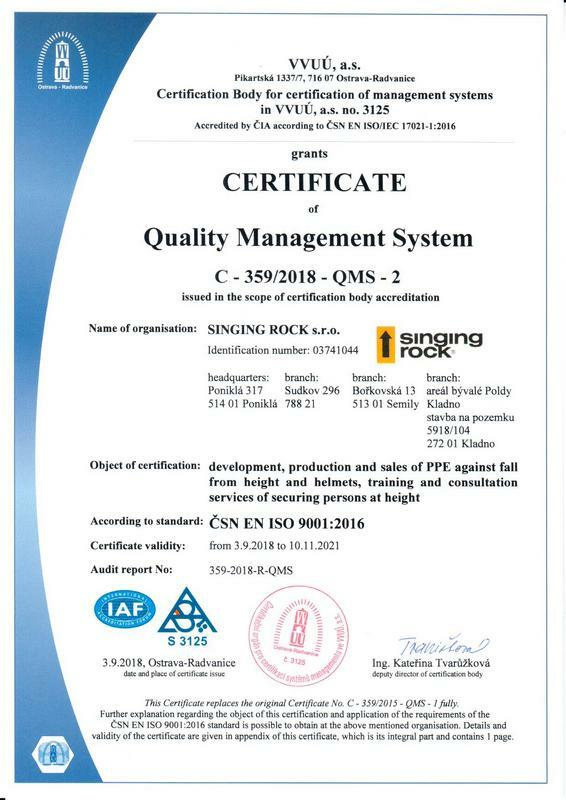 succesfully passed the re-certification audit of its Quality Management System at the requirements of ČSN EN ISO 9001:2016 with special attention to development, production and sales of PPE against fall from height and helmets, training and consultation services for securing persons at height and at the audit extended for special audit system of Produciton Quality Assurance with requirements of Regulation (EU) 2016/425 of the European Parliament and of the Council.